The town of Ventimiglia counts about 26.000 inhabitants and it is situated in the province of Imperia. It is the last Italian city placed on the border between France and Italy in the neighbourhood of Roia river outlet. Nowadays, its economy is relative to summer tourism and to the flowers business, because the city is one of the greatest flowers producers at international level. During summer, lots of tourists coming especially from Piedmont and Lombardy inundate the city for its sea resorts, gardens, monuments and beautiful churches. 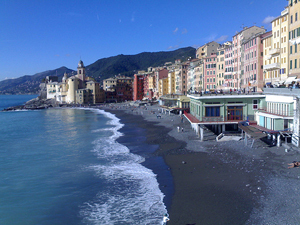 This city preserves a special peculiarity: the Roia river, which lows into the Ligurian Sea, divides the city in two parts: the first one presents medieval characteristics, rises on the hilltop and it’s called Ventimiglia Alta; whereas the second part is modern and it is built on the left bank of the river. Its climate presents Mediterranean features: mild, only occasionally you can find the north wind blowing in this area, a wind which comes from the Roia valley. Here there are a lot of interesting things to see, first of all the Cattedrale dell’Assunta, a picturesque cathedral which probably dates back to 11th or 12th century. Near the cathedra, you cannot also loose the Baptistery, which was built in 11th century and was dedicated to St. John Baptist. In addition, visitors will find the St. Michele Arcangelo Church, built in 10th century by Ventimiglia Earls and then it was put into the hands of the Benedictines of Lerins. Its structure was modified in Romanic style in 11th and in 12th century, where the apse, the nave and the bell tower were added. You will also have the chance to visit important archaeological sites, in the east area of Ventimiglia, which include the city of Albintimilium, the thermal baths and the Roman Theatre. As for those who are interested in discovering natural areas, in the surroundings they will find the Hanbury Botanic Gardens, also known as Villa Hanbury, which are the main botanical gardens operated by the University of Genoa. Its collections include agaves, aloes, and salvia, as well as fine old specimens of Araucaria cunninghamii, Casimiroa edulis, olive trees, Olmediella betschleriana, and Pinus canariensis . An orchard of rare fruits includes Actinidia, Carica, Diospyros, Eugenia, Feijoa, Fortunella, Macadamia, Mespilus, and Persea.